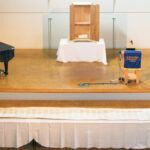 The authentic Jewish Torah was generously gifted during a February 9 dedication and celebration. Mr. Larson, who is the founder of Slumberland Furniture, says that the couple had been told during a prayer meeting years earlier that they’d do ministry together. When they were invited by Josh McDowell—the Christian apologist—to Tajikistan to help with a program, they said “yes” to God, thinking that this could be their ministry together. Though that trip was canceled, they continued to say “yes” to God, landing them in South Korea with the apologist. 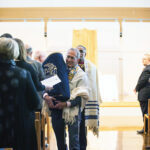 There, McDowell shared about how he had recently purchased a Torah scroll and how it was the most impactful tool he’d experienced in more than 50 years of ministry. Not long after the trip to South Korea, the Larsons traveled to Israel with their family—35 members including children and grandchildren. When they returned to the States, they visited a seminary with Dr. Scott Carroll, an expert manuscript researcher. There, Mr. Larson asked the Hebrew professors if they’d ever read from a Torah scroll. They all said that they’d never had the opportunity. This was the turning point. Ken and Barbara looked at each other and knew that this was going to be their ministry together. As they had done so many times before, they said “yes” to God. 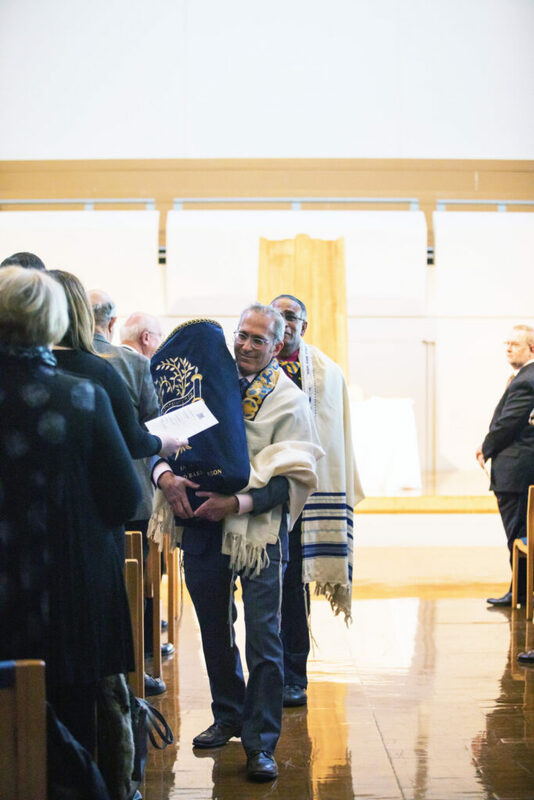 They bought a collection of Torah scrolls and, since March of 2014, have given 32 to institutions around the world. North Park is the 32nd recipient. 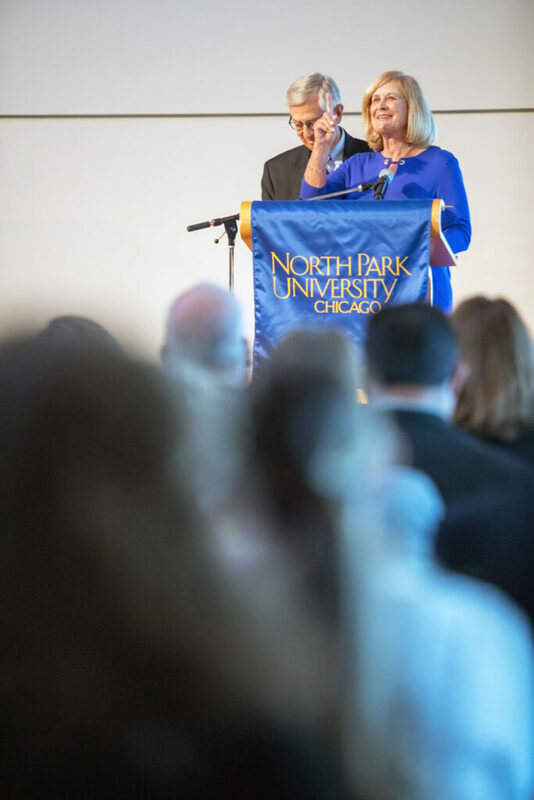 Barb Larson was happy to give the scroll to North Park because she’s a Chicagoan herself. “We feel right at home here.” She reminisced about her childhood, growing up living in an apartment on Montrose and Broadway. She attended Senn High School, which was, at the time, primarily Jewish. It was there that her love for Jewish people began. 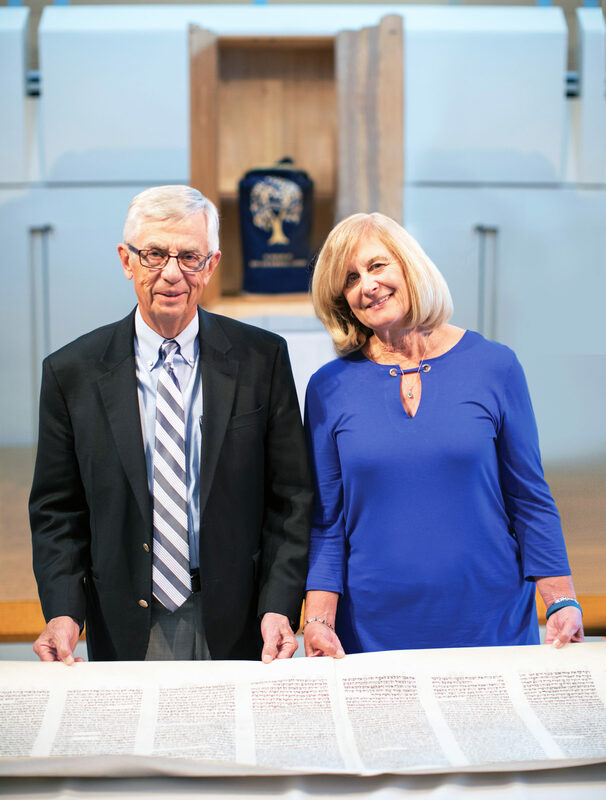 “It’s so thrilling to be back here and feel the energy that Chicagoland has.” Barb and Ken are most interested, though, in giving scrolls to institutions that have a respect for the word of God. North Park—being Chicago-centered, intercultural, and rooted in faith—was a perfect match. 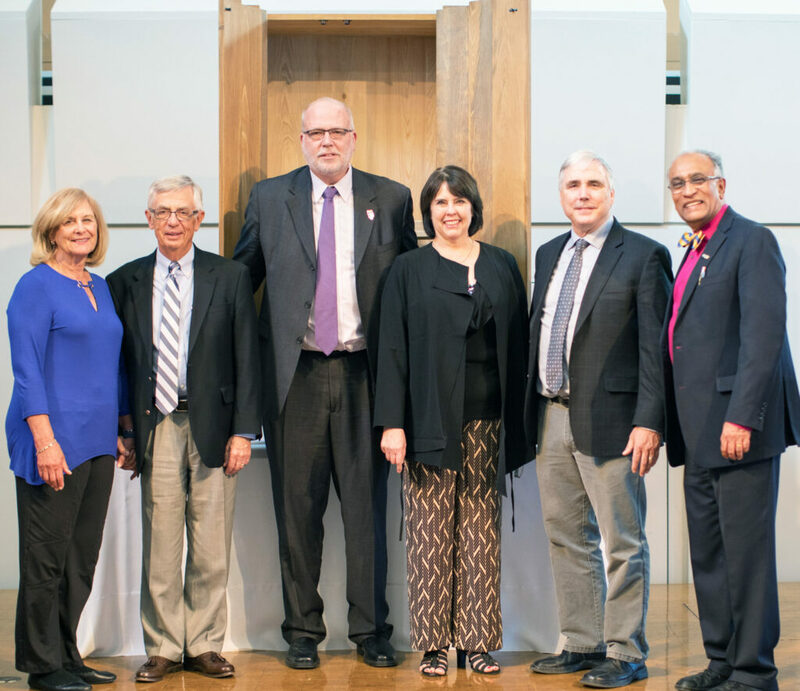 North Park’s Office of Advancement and the Seminary expressed gratitude for the gift with an elaborate and inspiring ceremony, featuring a traditional Jewish Torah Service liturgy, including readings and cantillations. 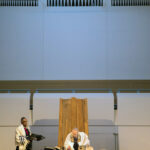 Dr. Rajkumar Boaz Johnson, professor of biblical and theological studies, and Skokie-based Rabbi Jeffrey Weill led the liturgy. 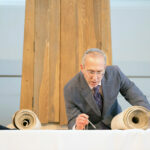 Dr. Johnson sang the Shema before he and Rabbi Weill processed the scroll through the chapel. Dr. Johnson coached participants to, as the Torah passed them, touch their program to it and then kiss the program. This, he said, was an act of gratitude to God for his word. 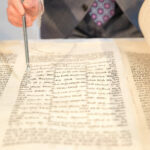 Rabbi Weill lained the Torah text, the Song of the Sea. Laining is melodious chanting of the scripture portion. The rabbi commented upon the exceptional beauty of the ornate scroll. 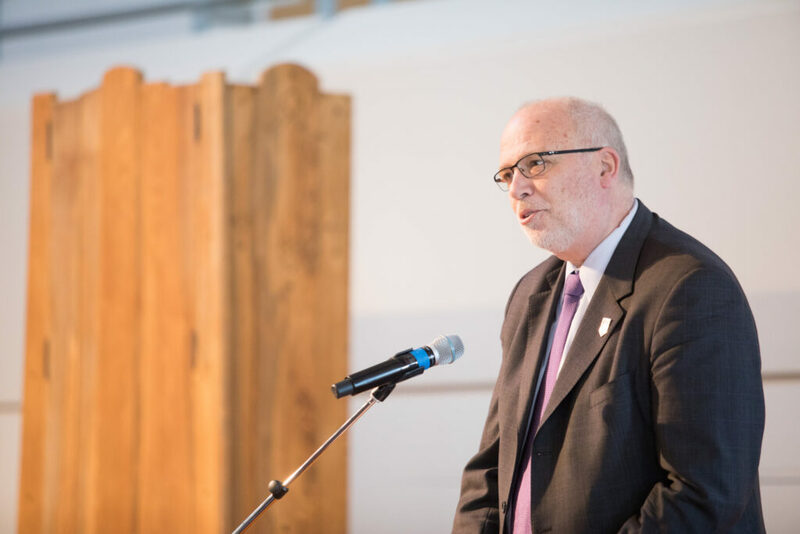 Dr. James Bruckner, professor of biblical interpretation, presented the D’rash, an exposition of the text, in which he considered how the bones of Joseph were carried with the Israelites as a remembrance representing the story of God. This, of course, is also true of the North Park-Larson scroll, a relic stewarded by God’s people as a remembrance of the story of God. 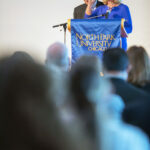 Dr. Kristine Strand, chair of the Board of Trustees, explained in a letter to the Larsons that North Park is “an educational institution of deep Christian identity” and that it’s devoted to giving students opportunities to enrich their understanding of the Bible. The trustees are grateful that the North Park-Larson scroll will offer these opportunities for enrichment. 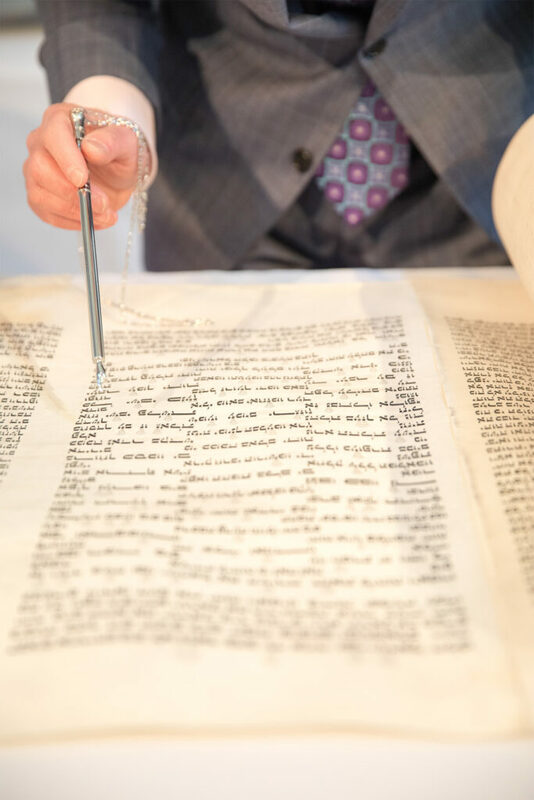 The scroll itself is decommissioned—no longer used in Jewish liturgical settings—and can now be used for exhibit, display, and teaching. It’s from the late 18th century with Ashkenazi origins, most likely from Poland. It has unusually beautiful orthography and unique decorative features adorning its letters. Dr. Carrol concluded that the scroll was a great labor of love for the scribe who produced it, and it was likely a point of pride for its original congregation. 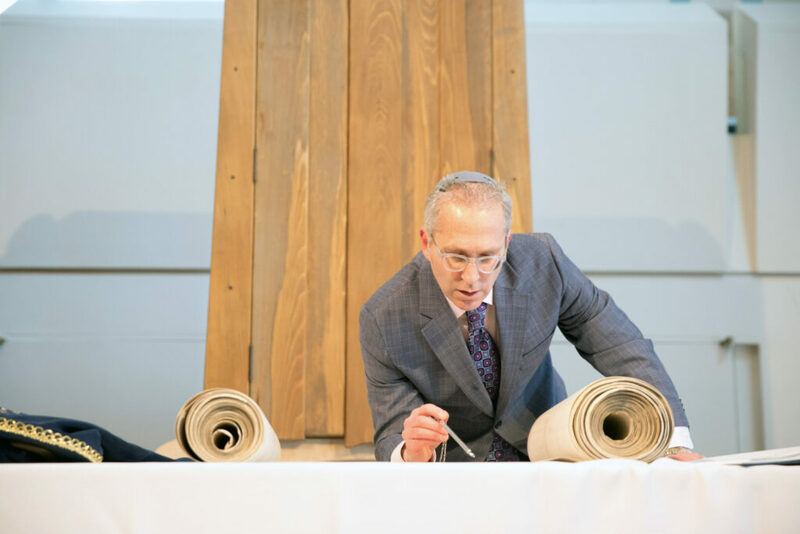 It is now a point of pride for North Park, which is honored to be a part of this scroll’s rich history, a history that includes surviving the Holocaust. The scroll will be housed in either the Brandel Library or the Seminary, kept within its handcrafted ark. The design of the ark—crafted by Dr. Johnson’s friend, Chris Olofson—was intended to be rugged to reflect the age of the scroll. 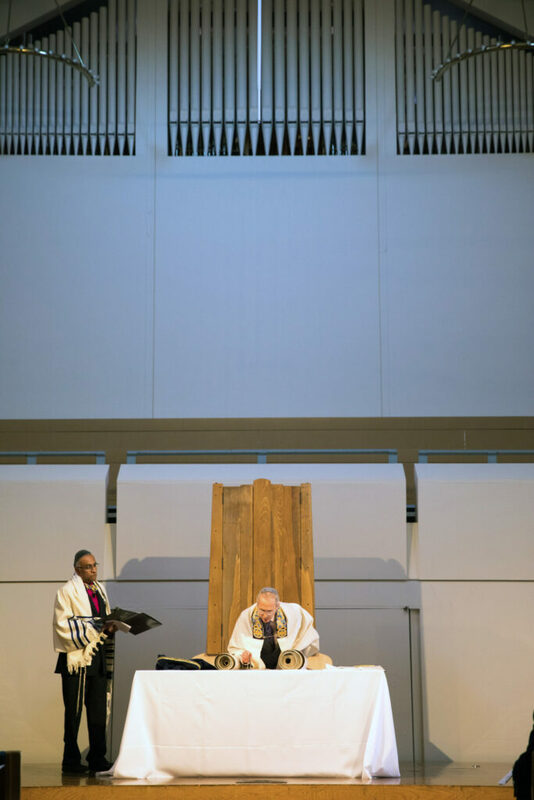 It’s made of solid cypress, a wood indigenous to the Holy Land, and the vertical planking is intended to reflect the Mishkan, the Tabernacle. The Ark is supported by a maple plywood laminate base in the favored style of modern Swedish furniture. This reflects the support of the Swedish community—from which North Park was founded—for the Jewish community. 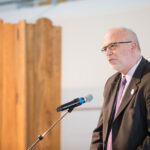 Dr. David Parkyn, president of North Park University, expressed gratitude to the Larsons and closed the ceremony with a prayer noting that the study of the holy scriptures has been central to North Park since its founding 125 years ago. 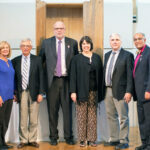 The gift, he said, marks the school’s new level of commitment to the scriptures.